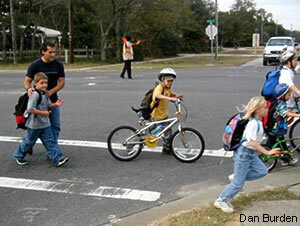 Street crossings are a vital part of the safe school route. Speeding on residential streets is cited as one of the top concerns of local citizens. Additionally, vehicles were parking too close to the crossing areas at schools, reducing visibility and increasing the potential for crashes involving young pedestrians. The City partnered with citizens and community groups to incorporate school pedestrian measures into a two-year Neighborhood Traffic Calming Program. The first year focused on driver behavior through education and enforcement programs, and in the second year infrastructure improvements were used if necessary. For this project, five different school locations were selected for facilities improvements on the basis of the high number of students living within walking distance. Swansfield Elementary School in Columbia, MD held its first Walk to School Day in 2005. The event was so popular that the school launched a Safe Routes to School program soon afterwards. From the outset, Swansfield's program involved students with disabilities. During Walk-to-School days, the school designated an alternative bus drop-off location a short distance from the school (along a school walking route) so that children who could not walk to school would be able to participate — including students with disabilities who receive special busing services. Teachers and parent volunteers were posted at the alternative location to assist special education students so that they were fully involved in the event and were able to walk to school with their peers. In addition to ensuring that SRTS encouragement programs included students with disabilities, Swansfield used SRTS grant money (including federal and local funds) to improve accessibility to the campus, including eliminating key sidewalk gaps and installing ADA-compliant curb ramps.